Sitting outside the Rifflin'Hitch Lodge overlooking the Eagle River in Southern Labrador in Labrador, Canada is the ideal way to enjoy a gourmet dinner prepared by the chef. A glass of red wine is the perfect beverage to accompany a meal of lobster tail, beef and vegetables. A gourmet meal of Surf'n Turf and a glass of red wine at the Rifflin'Hitch Lodge backdropped by the Eagle River in Southern Labrador, Labrador, Canada. 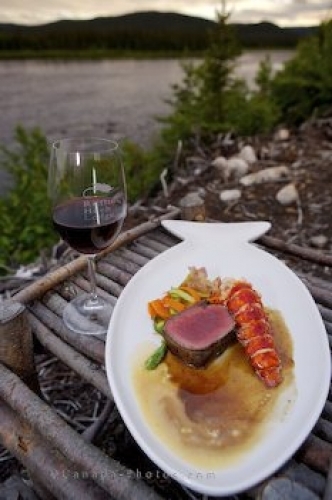 Picture of a gourmet dinner of beef, lobster and wine served at the Rifflin'Hitch Lodge, Labrador.